We knew when we bought our cabin that the dark wood paneling was not for us – the interior walls were finished in vertical cedar paneling that had become fairly dark and a bit grimy over the years – not what we were looking for. 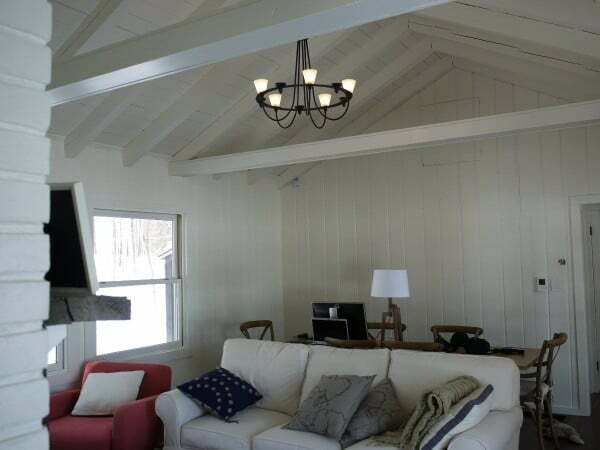 While painting wood paneling is not for everyone, many may prefer the look and feel of traditional vertical knotty pine or cedar wood paneling, but we were looking for something different. 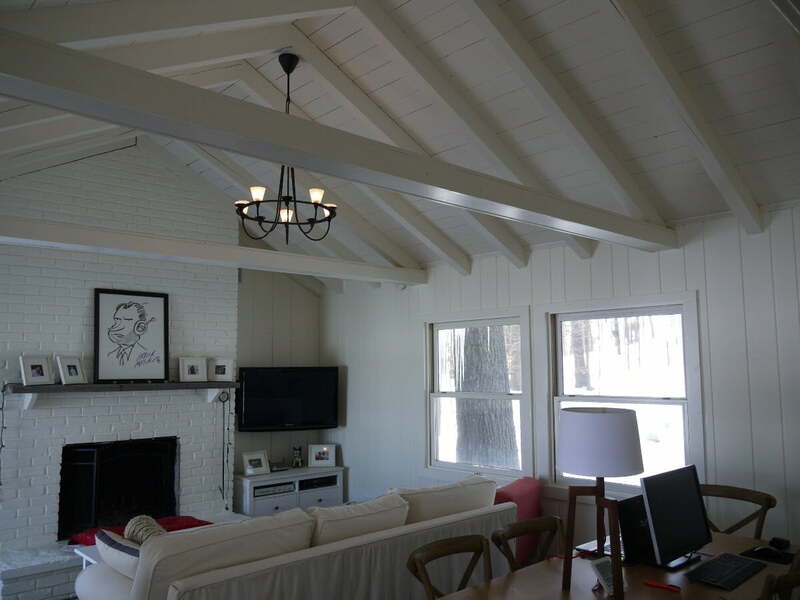 We hoped to create a light, bright interior that was more cottage than cabin. Think East Coast cottage instead of the traditional Midwest hunting shack. To achieve this and keep a nice balance of a warm white, we used was a terrific off white that my wife found, White Chocolate from Benjamin Moore. So how exactly did we do it? Easy… we used an acrylic (latex) finish coat on top of two coats of shellac (alcohol-based) primer and finished the trim and beams were finished with waterborne alkyd (oil) over the same shellac primer. Read on for a step by step, illustrated, how-to on painting wood paneling and see just how we did it. The existing dark wood paneling in cabin before painting the old cedar paneling. The after photo of our cabin interior after we painted the wood paneling. Another view of the dark wood paneling in the living area before painting. The same interior view as above after painting the paneling and ceiling. Prior to painting remove or cover all furniture, fixtures and appliances. Cover the floor with drop cloths or similar to protect from paint. Tape off and cover windows and electrical switch / recepticle plates. Assembly painting supplies and tools. 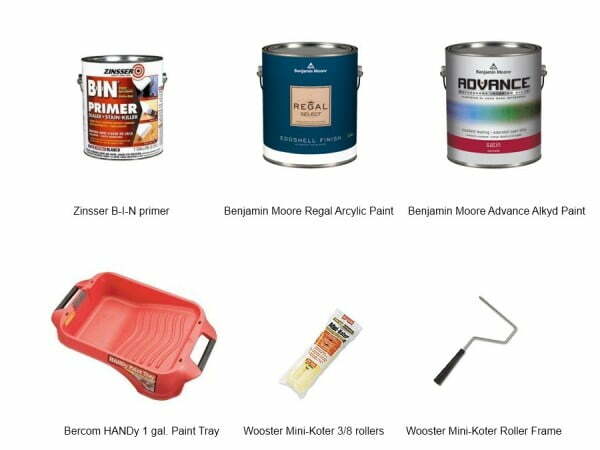 Gather paint, brushes, rollers, ladders, tools and supplies. Zinsser BIN, Benjamin Moore Regal Latex in white chocolate, HANDy paint tray and the mini-koter roller system from Wooster. Dust and clean surfaces to be painted. Thoroughly dust all to-be-painted surfaces with microfiber duster or lambswool duster. You may also use a vacuum cleaner with a wide brush attachment. If your paneling is dirty or has a residue (think kitchen grease), you should consider cleaning the surface with an appropriate solvent or cleaner. Trisodium phosphate and water is often used, but check the recommendations of your paint products — Zinsser B-I-N recommends using an ammonia / water solution and not TSP solutions. Rinse well after cleaning and allow to dry for at least 24 hours. Apply first coat of primer. 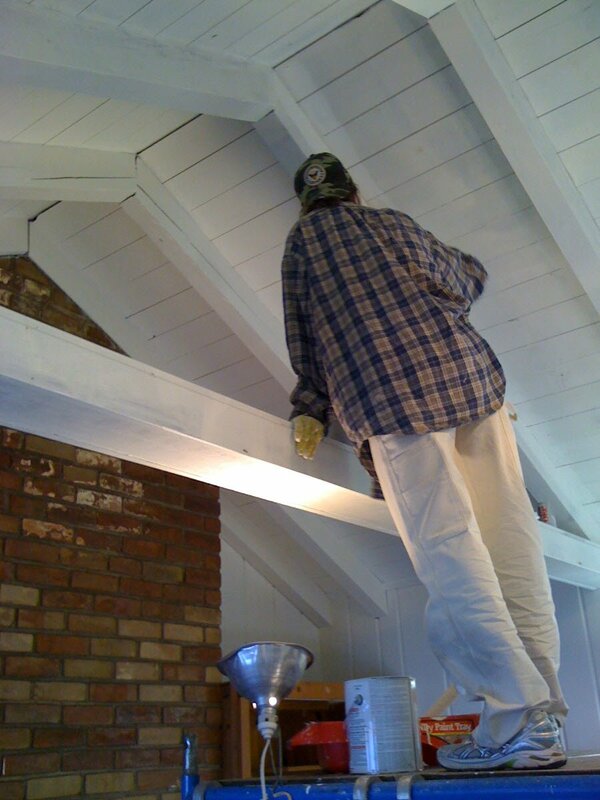 Begin applying the primer to the ceiling, starting from the top (highest portion) of the ceiling and work downward. This will help control the flow of paint. Next, prime the wall. Again, start at the top of the wall and move downward. Depending on the primer you are using, the surface you are trying to cover and the final color of your finish, you may need to apply more than one coat of primer. 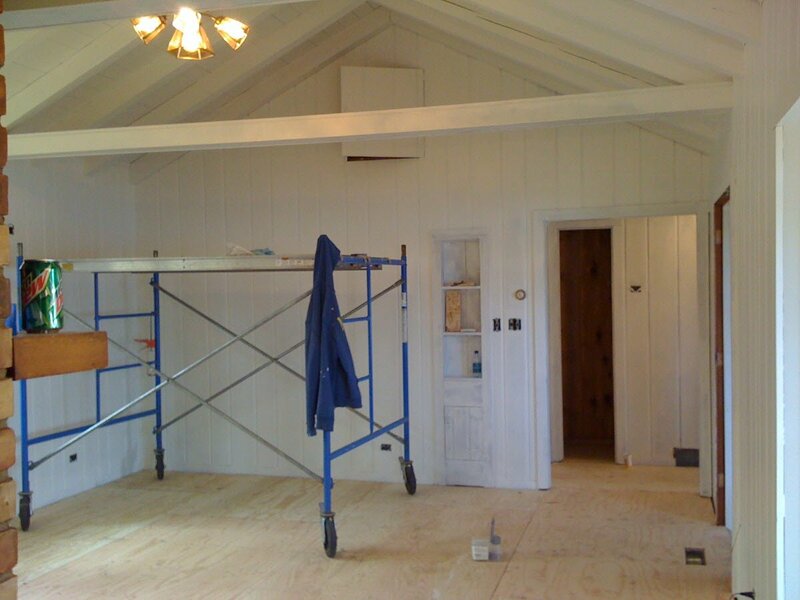 Knowing that we were using a white finish over the dark paneling, we planned on applying at least two coats of primer. Follow the recommendations of the primer you are using for drying times required prior to second coat application. The beauty of the shellac (alcohol) based products is that they dry very quickly, and can be re-coated in an hour or less. Additionally, the alcohol based products have very good adhesion qualities and tend to “bite” into the surface you are painting. This is particularly true for our varnished wood paneling that we were painting, making this type of primer an excellent base coat for the finish paint. This primer (Zinnser BIN) also has excellent sealing properties helping to eliminate odors (smoke, etc) from the paneling. We applied the primer by the traditional technique of using a brush to cut in corners and a roller to cover the large surfaces. For the roller, we used the light-weight Mini-Koter roller system (6 1/2 inch) by Wooster. We found it my less fatiguing verses conventional rollers, especially when working overhead. We started with the ceiling and then moved to the wall paneling. To paint the tongue and groove wall, we found that the small Mini-Koter rollers turned vertical fit perfectly in the vertical groove of the paneling and could do both the “cut-in” work in the grooves and the surface finish work without using the brush — this was a big time saver. Again, paint from high to low to help control drips and the flow of the paint. Apply a second coat of primer (if needed for color or stain coverage). Using the same methods as above, we added a second coat of primer to the walls and ceiling. Because the shellac base primer dries so rapidly, we were able to keep our scaffolding setup on one stop for both coats. Elena celebrates near completion of the second coat of primer! Once the primer has fully dried (check the recommendations of the primer you are using), apply the finish coat of paint. Using the same techniques of brush cut in, roller finish and working from high to low, apply the first finish coat. Depending on the product you are using and your finish color, you may need to apply two finish coats for a satisfactory finish. 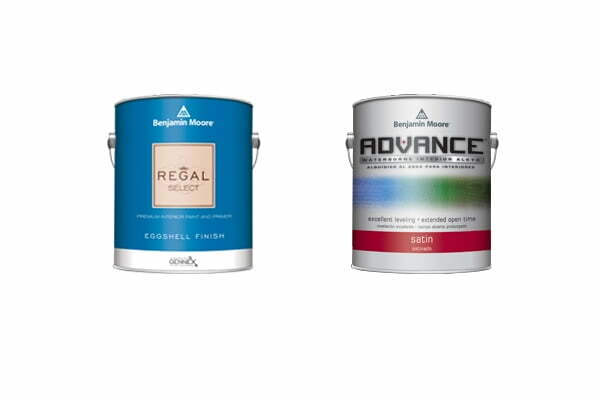 Follow the manufactures recommendations for second coat application. 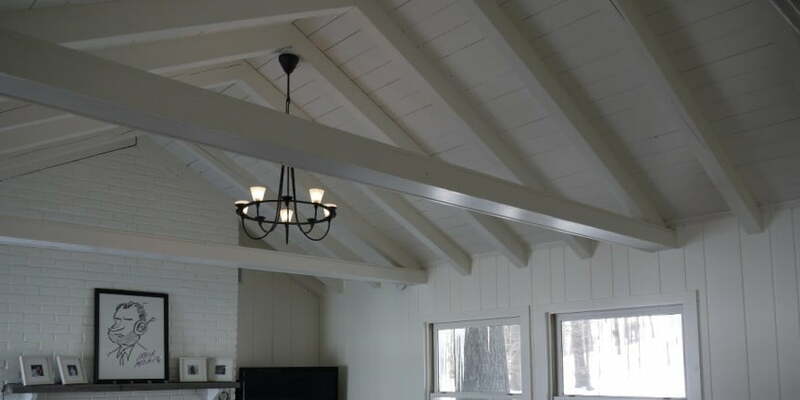 As stated above, we used an acrylic (latex) paint, Benjamin Moore Regal interior acrylic eggshell for our finish coat for both the paneling and roof boards. Ceiling and walls complete with two coats of primer and a single finish coat. Finish coat the ceiling beams and trim. To add contrast to the trim elements we used a different paint, one with a slightly more glossy finish (Benjamin Moore Advance waterborne interior alkyd satin), to finish coat the trim. 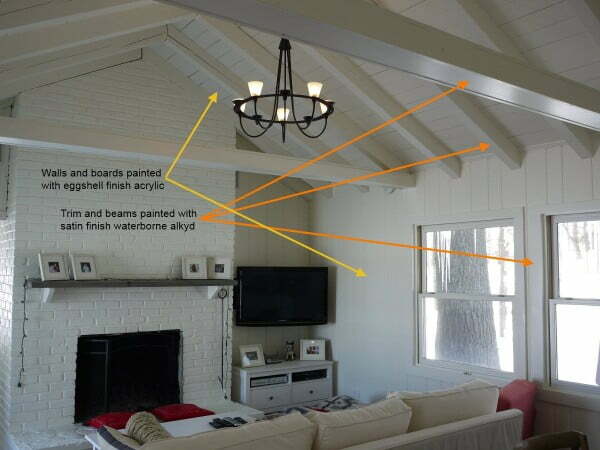 Adding contrast by using a slighty more glossy finish on trim and ceiling beams. Benjamin Moore paint used for entire project. Regal Select Eggshell for paneling and Advance Satin for trim and beams. Color for both is OC-127 White Chocolate. This alkyd satin finish paint gives the wood trim elements a slightly harder finish (more washable too) and a bit of brilliance next to the matte appearing eggshell finish latex. We used the same color, Benjamin Moore’s White Chocolate, for both paints. Painted paneling in our cabin. Old vertical cedar paneling painted cream white. The existing dark wood paneling in cabin before painting the paneling. Scaffolding setup to start prime coat of paint. Second coat of primer applied to ceiling boards and beams. Scaffolding ready to begin finish coat of paint. Thanks for the feedback. I would agree that painting wood paneling is not for everyone… but for some, it provides options other to traditional knotty paneling, something more coastal and cottage. I admit, when my wife suggested painting the paneling, I wasn’t totally sold on the idea, but after living in it, I think its perfect. It feels open, light, calm and highlights contrasting elements like the wide plank walnut flooring and reclaimed pine fireplace mantel. Just purchased a home with lovely light soft colors throughout and it looks wonderful…until you walk into the dark cedar paneling room – yuck! I was so happy to stumble across your paint job – it is FANTASTIC!! I was thinking I had to rip it out and drywall, etc – but NO – I’m going to be painting it white. “Pondering” – there are certainly some wood walls that should not be painted…this is NOT one of them. Seriously – you must be able to see the improvement the paint made to the cabin. It went from hideous to fabulous! Did you sand the panels down first? No. We did not sand, just wash them and let them dry. The Zinsser BIN primer seemed to have excellent adhesion without sanding. Thanks so much for the step-by-step instructions. Just what we need to get started. We also have a brick fireplace. Just wondering how you painted the brick? Did you use a spray gun? Any instructions/tips you can offer would be greatly appreciated. Thanks! For the brick we prepped the surface with a stiff broom, wire brush and a good vacuuming. To paint the brick we used a thick nap (1/2″) mini roller (MINI-KOTER® HIGH-CAPACITY 1/2 IN. NAP). I believe we used a latex primer first (Rust-Oleum® Zinsser® Bulls Eye 1-2-3® Water-Base Primer) followed by a latex exterior siding paint (Benjamin Moore Regal in Satin). The 4″ mini roller worked well to get the paint between the bricks if you pushed the roller into the masonry seams and then followed with a brush as needed. I will verify the products we used by late next week (I am headed to the cabin mid week next week) and reply back here (and maybe add some photos or another how to). Be prepared to spend some time with the fireplace, brick takes time to paint and we used a total of three coats — a coat of primer and two coats of finish. The results were and are fantastic! No signs of peeling, cracking or breakdown — it still looks great. Thanks for the question Suzanne, and thanks for using the site. I will update next week. Thanks so much for your speedy reply! 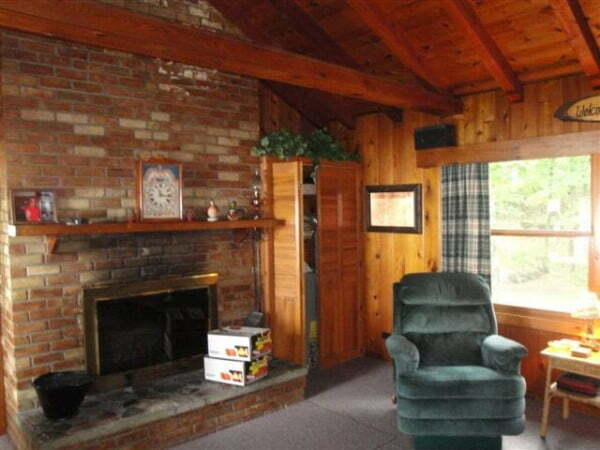 Luckily, our fireplace has already been painted and we are just wanting to give it a fresh coat. Great to know about the 4″ mini roller and the type of paint. I see that you did not put back the brass frame for the fireplace. We are planning on painting ours black (with BBQ paint)and putting it back. 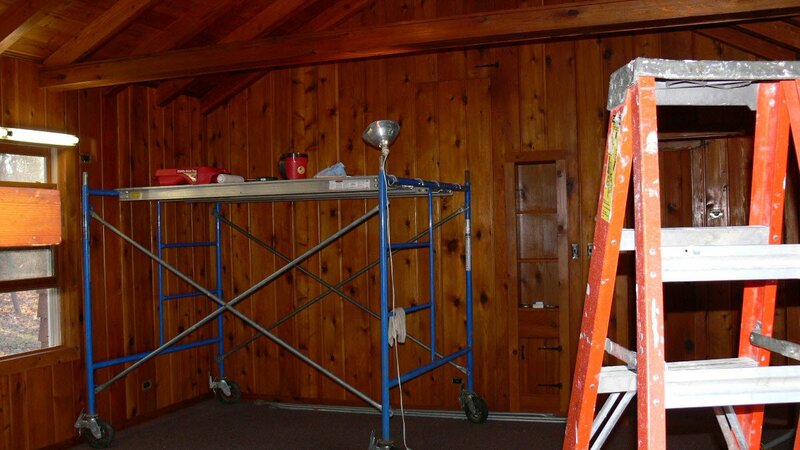 And we are about to embark on painting our cedar walls – looks exactly like yours in the “before” pics. I can hardly wait to get started. Thanks again for all your detailed info re painting the wood!! You’re welcome. Good luck with the project! Let me know how it goes (maybe even a photo of the finished product). Were your cedar panels already smooth or rough? Ours are really rough, look like they have never had any kind of sanding down, and are great at catching dirt. I vacuum them every few months–what a pain. I always get splinters when I brush up against them. Our paneling has a fairly smooth surface. If you decided to paint your paneling, you should be able to “smooth” the surface and likely make them easier to clean. You may benefit from an extra coat of a high-pigment content primer (like the Zinnser B-I-N primer I mention above) to help fill the surface of the panels. It sounds like the panels may not be finished at all if you are getting splinters. Thank you so much for your tutorial! ! Our room looks very similar to yours. We were considering using a spraygun. What are your thoughts on that? Thank for the comment and congrats on your project. I think you will happy you’ve decided to paint the walls. It has been three years for us and we still love it. I think spraying your walls is fine and probably a whole lot faster. One small concern may be the primer you use. We really found the alcohol based primer to work well, but it dries very fast, whiich may make using the sprayer with it a bit more challenging to keep the gun clear,etc. I suspect you can find specific directions for spraying the primer on the product website or other. Best wishes with your project. Post a photo if you like. Hi, we couldn’t be doing this reno with out your great photos and list of products used. Many thanks. We purchased an all cedar interior home. It’s so dark and depressing! So we have gutted the kitchen and now on to paint the ceiling and walls white. This place will be transformed! !!!! Can’t wait for the project to be completed. It will be bright, fresh and cheery. Then onto the other rooms. Thanks for the kind words. We were initially inspired by a New York Times article about a transformation of a Cottage in the the Catskills. The original article had more images showing the transformation that came from painting dark wood paneling white. It’s been quite a while since your original post, but maybe you’ll see this question. I’m planning to do the same project in our cabin in north MS, but I’m wondering about when to get started. I’m assuming I’ll need windows open for ventilation while I’m working. I noticed you don’t mention respirators. We’re the fumes from the primer not that bad? Thanks for the question. Start by cleaning the wood paneling. Once the paneling is clean and thoroughly dry, start the painting process by priming the paneling with a quality primer. I like the shellac (alcohol-based) primer by Zinsser (BIN primer). The alcohol seems to bound well to the finished paneling. To answer your question regarding ventilation… yes, you should allow for ventilation of the room(s) you will be painting – depending on the paint products you plan to use. The Zinsser BIN primer is an alcohol solvent base and gives off moderately strong alcohol vapors. You will want to have good ventilation while using this or similar products. You certainly can use a respirator, but I did not. The good news is the primer dries very quickly (10 – 20 minutes or so) and will only need the ventilation for a short time. Once the primer is dry, apply a finish coat or two of paint. I used a high quality latex paint from Benjamin Moore for my finish coat. Modern latex interior paints are low-VOC (volatile organic compounds) and give off little odor. Good luck with the project, I think you will be very happy with the results. 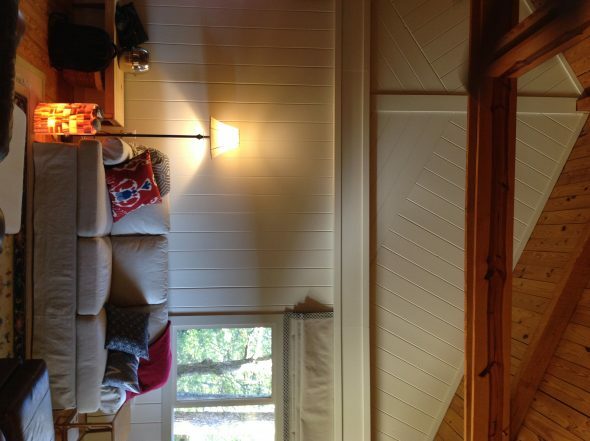 Hi CDIY, I’m sitting in my freshly painted wood paneled cabin, and loving the bright interior. Since your post continues to get a lot of traffic, I wanted to let you and your readers know what worked for my project. All my paneling was finished with a clear coat of polyurethane. I realized since the knots were already covered, I didn’t need to worry about bleed through. I used BIN 123plus latex interior primer. I’ve had no bleed through, and since it’s low VOC, I didn’t have to wait until the weather was cool enough to open windows. For the finish coat, I used two coats of Valspar eggshell latex. I painted the walls and gable ends to the peak, but not the ceiling. The project was time consuming, but absolutely worth the time. Thank you for your post, and the quick response to my question. Thanks Peggy for the follow up! Feel free to upload a few images using the Upload an Image “Choose File” button field below. Here’s a picture of our cabin. I still have a lot of painting left to do, but we’re enjoying this room so much it makes the others bearable. Wow! I think it looks great. Nice work! 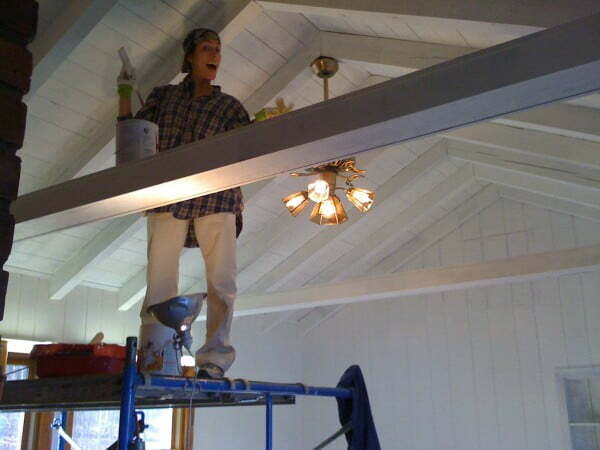 As you probably know from the article, we painted over our tongue and groove cedar paneling. We did not sand the paneling prior to painting. We did vacuum it well and sponge clean with a mix of ammonia and water. Depending on the primer you plan to use, check the recommendation of the primer for a suggested cleaner to use prior to priming. I used Zinsser B-I-N primer which is an alcohol based primer. Because it is alcohol based, you could also use denatured alcohol as needed to clean if you run into very oily areas needing cleaning. If you use alcohol, make sure the area is well ventilated. 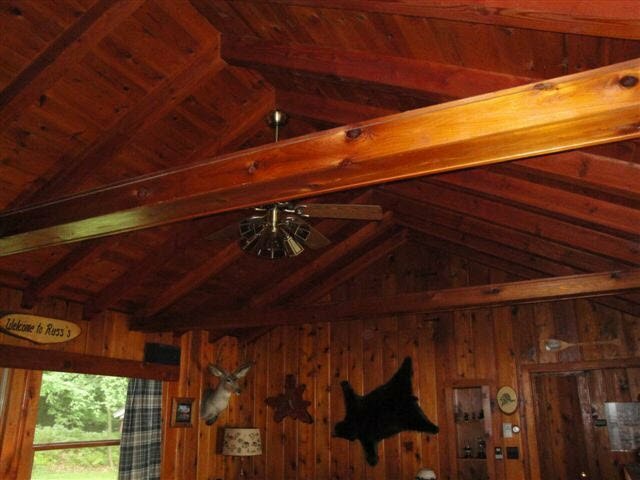 We are purchasing a home with knotty pine tongue and groove ceiling, heavy on the knots! We want to paint ceiling white, but are worried the knots will slowly bleed through. Have you noticed any knots showing up? We’ve seen postings where people have caulked between the tongue and groove to minimize any dark wood showing due to slight movement of the boards over time. Has this been an issue for you? Thanks! Congrats on the new home. 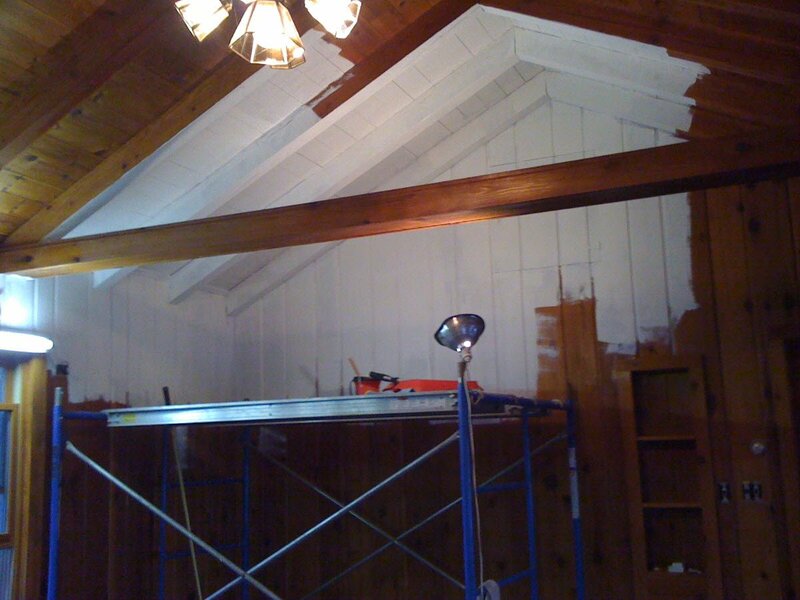 We too had many knots in our cedar paneling that we painted. After painting as outlined above with the BIN Zinner primer, we did not have any bleed through, knots or otherwise. I highly recommend using this product. Regarding the question of how to minimize “showing” with movement of the underlying wood after painting, I would not recommend caulking the seams. Not only is it a lot of work, but it may also damage the boards if they are restricted from movement. What I would recommend is painting them during relatively dry conditions when the boards are contracted. That way you should be able to cover the most surface of the wood. You can also just paint now and touch up as needed if the boards expose unpainted surfaces with movement. Good luck! Feel free to upload a few photos of your finished work. Did you use a respirator? I read that your recommended primer can be difficult on breathing. Thanks for visiting the site and thanks for the question. We did not use a respirator during the application of the shellac (alcohol-based) primer. You are correct that the primer does have a fairly high vapor release – mainly ethyl alcohol (also acetone if using the spray can product). We made sure to open windows and use good ventilation, but did not use a respirator. From my understanding, inhaled ethanol is a respiratory irritant, but probably not a significant health risk with short low level exposure. I made a mistake not researching painting pine paneling, and I used latex primer. How big is my mistake, and how can I fix it? Thanks for the question. 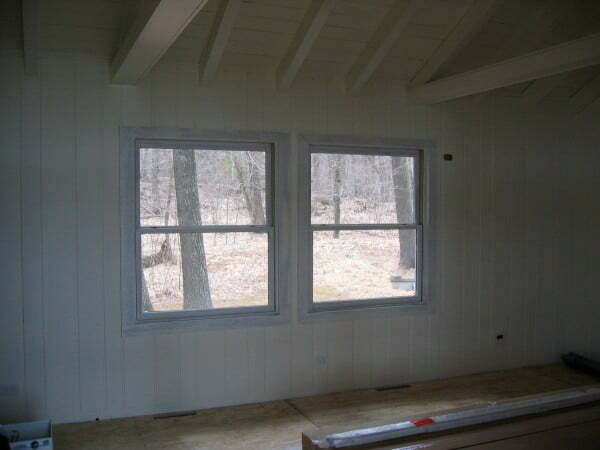 Depending on the condition of your paneling and the type of primer, you may be OK. I don’t think using a latex primer is necessarily a mistake, you just might not get the adhesion of a shellac-based primer. I would try scraping the applied latex primer (after a sufficient drying period) with your fingernail to test for adhesion. If the primer is easily removed, I would consider removing the primer and starting over with an alcohol-based (shellac) primer. If the primer seams to have a good bond, I would keep going with the primer and finish with a latex interior wall paint. About to do the same thing to our paneled finished attic. I am also a huge fan of Zinsser BIN when it comes to not sanding and good adhesion. Wondering if the finish from the rollers you used gave a smooth look, or was there an “orange peel” effect from rolling vs a smooth look spraying? Thanks for the question and using our site. The finished paint surface we obtained was slightly textured (eggshell like) using the Wooster minikoter 3/8″ nap roller. Wooster also makes a 1/4″ nap roller for a smoother finish and there are foam roller options as well that would provide an even smoother finish. You could also consider using a painting pad instead of a roller for a flatter finish. Good luck and enjoy the project. Also, how many days total did it take you? I plan to do this my myself and have 2 rooms 11×12 with sloped walls. Trying to schedule a block of time to tackle this project. Once you’ve cleaned the surfaces to be painted, painting should be fairly quick and you should be able to finish 2 coats of primer (if needed for dark starting surfaces) and get a finish coat on in a day or two. If you use a shellac primer (Zinsser B-I-N), the primer coats will dry in an hour or less, after which you apply the finish coat(s) – probably the same day. Sorry I missed this earlier and haven’t responded yet. If you haven’t found a solution yet, I would try Zinsser B-I-N which is a shellac based primer. Zinsser 123 is latex based and may not work as well in blocking the specific staining you have.